Searching for the best social media management tools, but still struggling to find the right one for the job? We know the feeling, in fact, with so many tools on the web to manage your social media presence, it can be very tough for finding the appropriate tool. 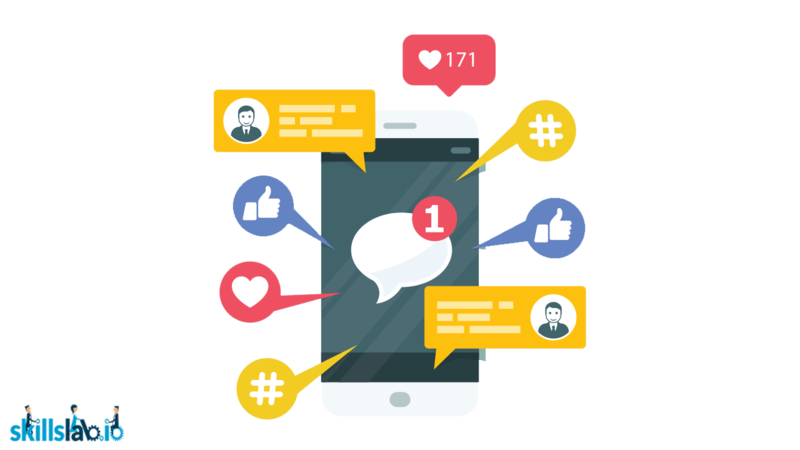 The ideal social media management tool should consist of a few major benefits, these include content publishing and scheduling, RSS integration, social engagement inbox, and fantastic analytics reporting. These tools are not arranged in any particular order. They are all fantastic and have their own unique interfaces and may work slightly differently to others. Free trial? – Yes, 30 days. Description: Similar to other tools listed in this article, Sprout Social specialises in providing several social media tools into one platform, helping you manage everything at ease. From social media scheduling, monitoring and reporting, you’ll have everything to manage your social media channels effectively. Sprout Social stands out with their CRM features, allowing you to have a complete profile of your customers so you can build stronger relationships with them. Free trial? – Free account. Trial for Pro plan (7 days), trial for Small, Medium and Large plans (14 days). Description: Buffer’s social media management tool focuses more on all-inclusive pricing, rather than a fixed per-user cost. 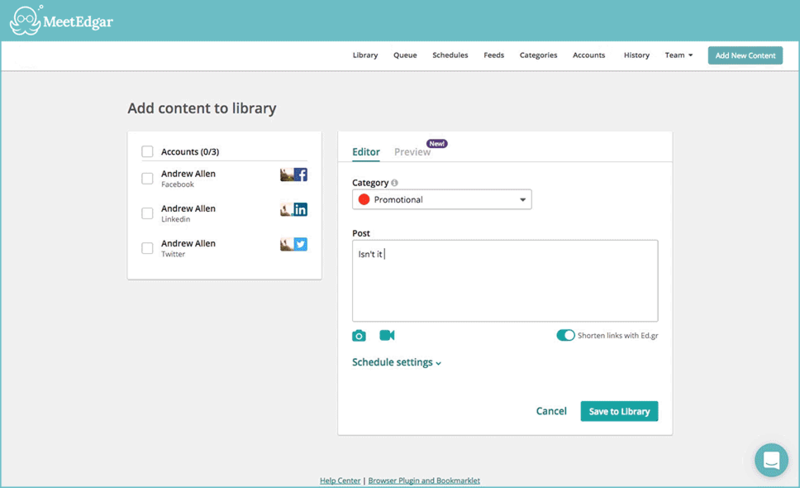 The tool offers many handy features for scheduling content fairly quickly. The tool also offers a free forever plan that allows you to connect three social media accounts and schedule up to 10 posts per account. Buffer makes it easy for everyone to save hours of scheduling and analysing performance. The analytics reports help you see how your posts are performing and allow you to create reports for your manager or clients with ease. One of Buffer’s great features is the ability to Rebuffer your best performing content. 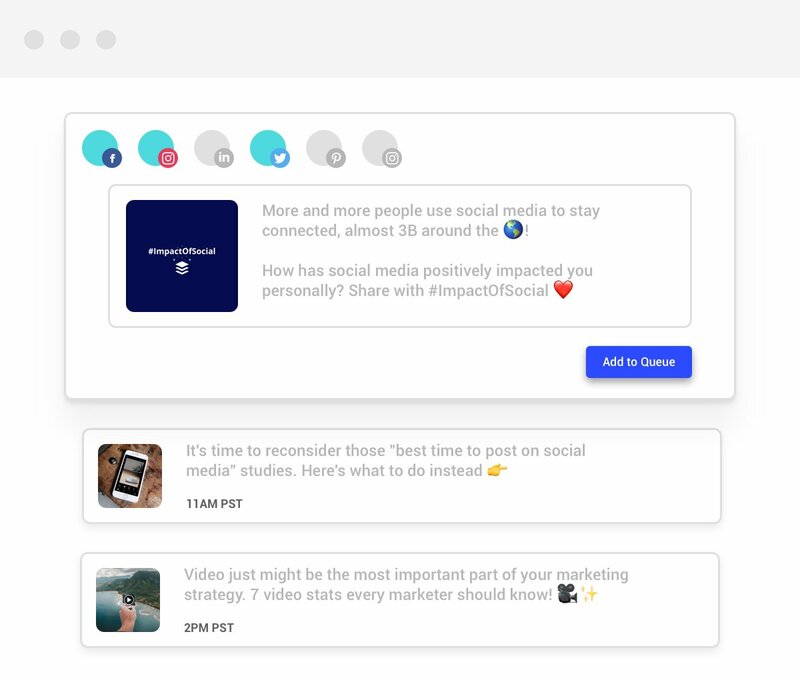 The social media management tool, Buffer is constantly adding new features to their platform to stay ahead of the game. One recent feature is the ability to schedule posts directly to Instagram. This also includes video scheduling for Instagram. Free trial? – Free plan. Trial for Professional and Team plans (30 days). 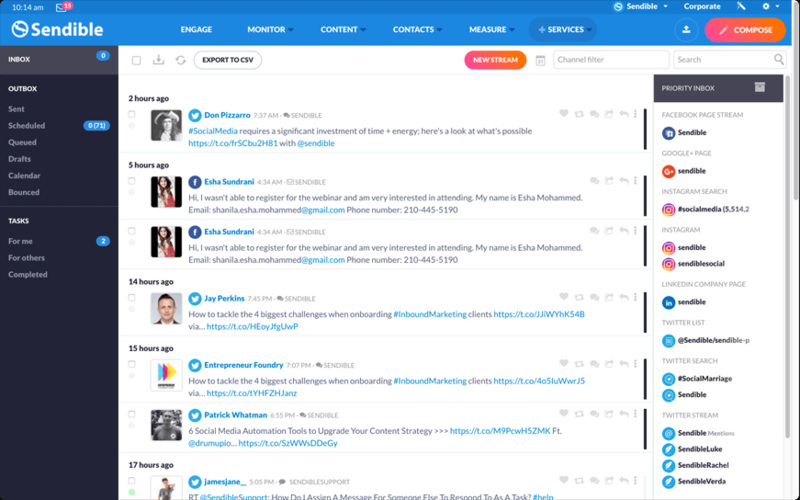 Description: The Hootsuite social media management tool focuses on helping businesses get results they can measure. The platform is set-up to create easy smart workflows for managing social media. With the ability of content curation, users can easily stay on top of content with pre-approved content for teams. Other features such as the monitoring allow Hootsuite users to keep track of brand, competitor and keyword mentions. 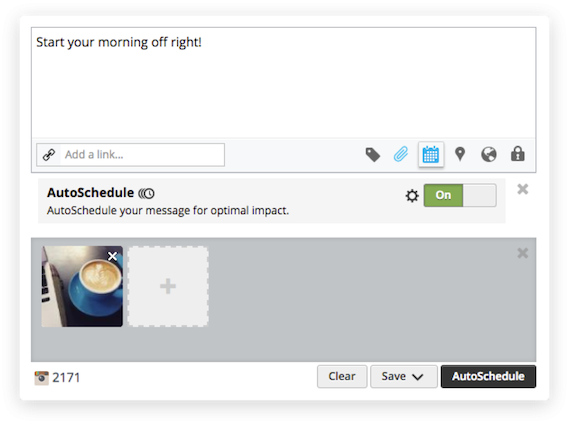 Hootsuite allow the option of adding additional features from the apps directory, allowing more integrations. Free trial? – 30-day free trial. Description: Sendible class themselves as the number 1 social media management tool for agencies. The tool focuses on allowing users to easily streamline their social media process and delivery for their clients. With the social inbox for each brand, content recommendation engine, actionable tasks and workflows along with fantastic reporting, we can see why agencies favour them. 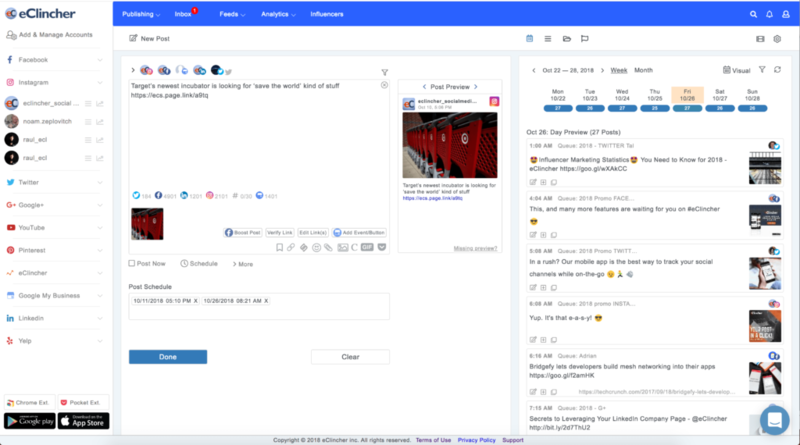 Sendible doesn’t just connect with social media accounts, the tool also connects with WordPress, Blogger and Tumblr, with direct access to Canva, Google Drive, YouTube and Dropbox. 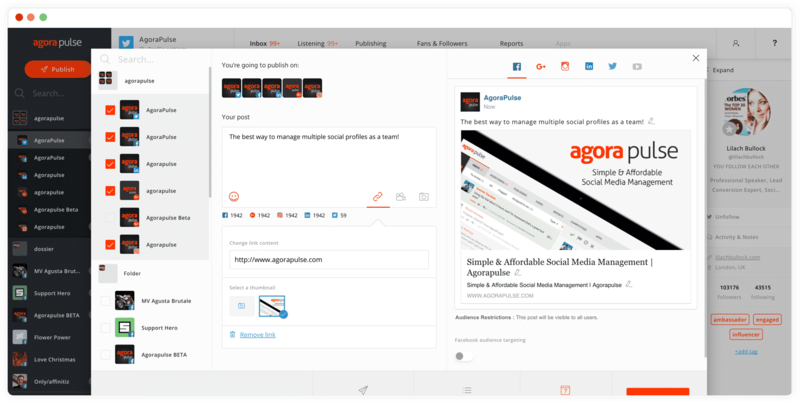 Description: Agorapulse is an easy to use social media management tool that comes equipped with many additional features. The tool allows you to harness your social media content and engagement with ease that is suitable for teams and agencies. Some of the best features of Agorapulse include social listening, one-click reporting and the team collaboration featuring tasks and much more. 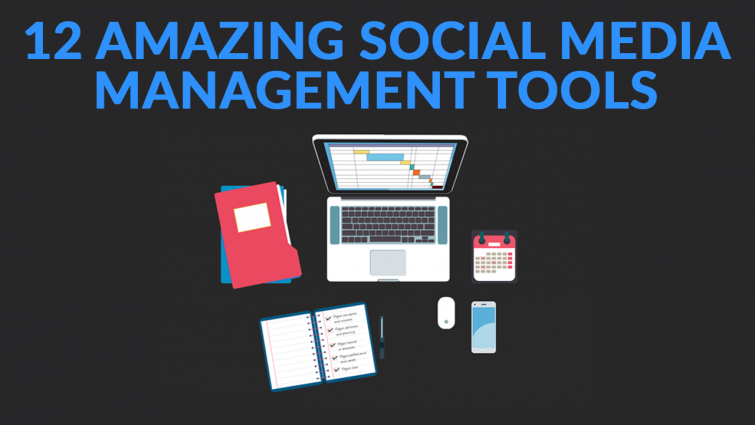 This social media management tool supports Facebook, Twitter, Instagram, LinkedIn and YouTube. Price of tool: Individual ($40/month), Growth ($80/month), Professional ($400/month *billed annually), Enterprise ($1,400/month *billed annually) Agency plans also available. Free trial? – Yes, 14-day trial. Description: CoSchedule has been the best tool by far I’ve used for when it comes to planning and executing various social campaigns. 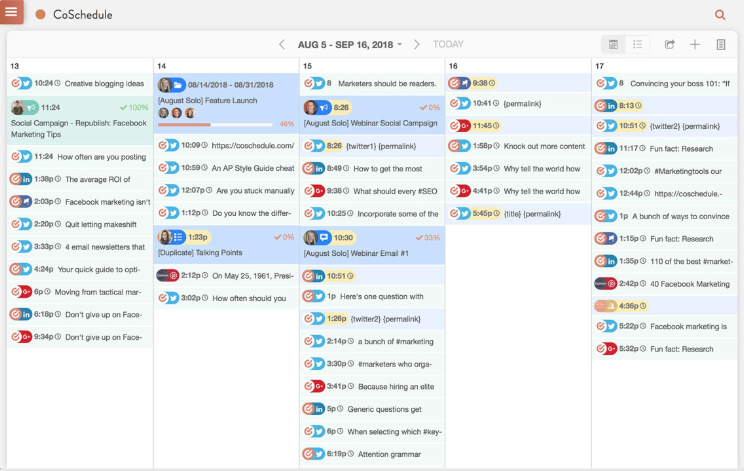 The kanban project dashboard allows all users to keep projects on track and manage every step of the process. The ability to keep all conversations and notes within the platform is brilliant. 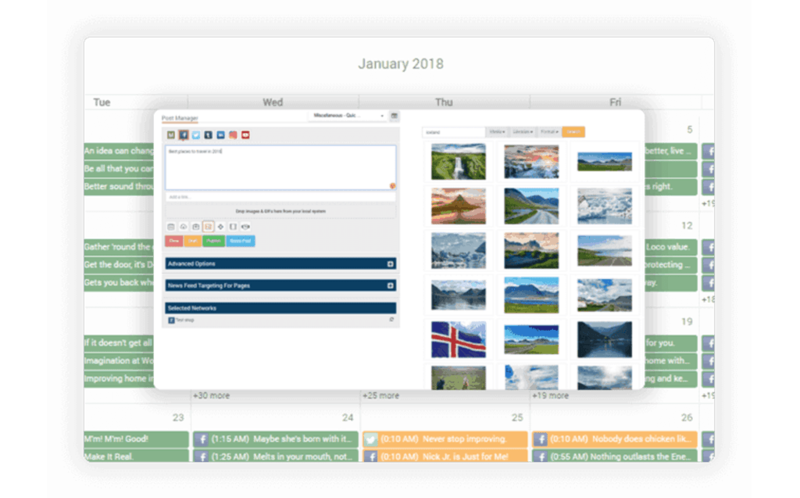 The tool also offers an easy to use marketing calendar where you can set-up various content types such as social posts, blog posts, videos, webinars, email campaigns and more – allowing you to have a full overview of all marketing activities planned. CoSchedule is definitely worth a look into. Free trial? – Yes, 14 day trial. Description: Social Pilot focus on providing a simple and cost-effective social media management tool for all sizes of businesses. The tool allows you to add all your social media accounts and schedule endless content without worrying about hitting limits. The social inbox is very useful for replying to all comments within the dashboard alone. Powerful analytics and white label reporting with just one click are possible with this tool. Better yet, Social Pilot even allows teams to set-up workflows, review and approve all content before its posted. Another handy feature is the ability to invite clients to connect their accounts directly and share reports through white label emails. Free trial? – No free trial, but 30-day money-back guarantee. Description: MeetEdgar main focus is to make scheduling content easy. The tool has only a few features in order to make this as simple as possible. MeetEdgar allows you to automate your content on Facebook, Twitter, Instagram and LinkedIn, from bulk-importing and RSS feeds, you’ll have everything to keep your content publishing and organised in colour-coded categories. The tool even released a feature to automatically write short snippets of content for you, saving you even more time. Description: eClincher class themselves as a very powerful social media management tool. We can see why when the tool comes packed with tons of useful features. From the ability to connect all your social media accounts to publish, engage, monitor, track and analyse them – you’re bound to grow your online presence. Other features such as the social inbox, auto post queues, auto post RSS, social listening, suggested content, advanced analytics and so much more come in very handy. The tool even allows its users to find influencers based on relevant keywords. Not only does this tool include an auto link shortener, but they also offer the ability to choose from free stock images and animated gifs. The built-in image editor and Canva integration is a fantastic addon. Mobile apps and Chrome extensions are also available. Description: Crowdfire is another social media management tool that aims to keep things simple. 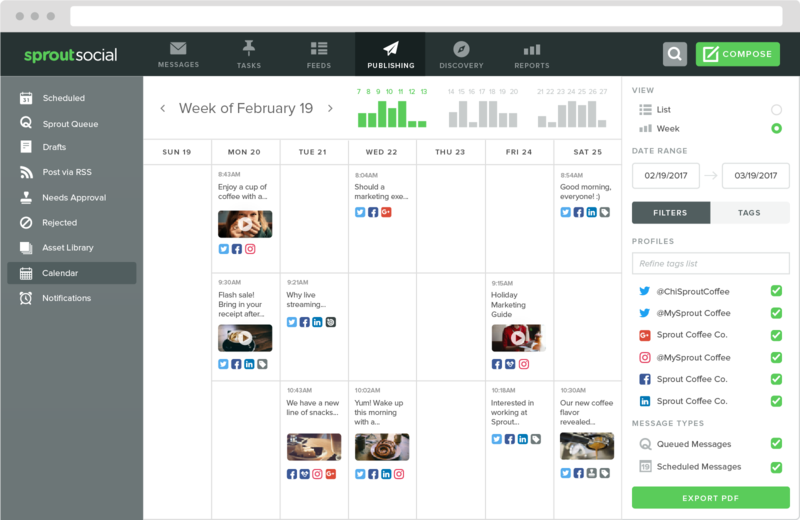 Crowdfire helps you discover and schedule content, managing your social accounts from one place. 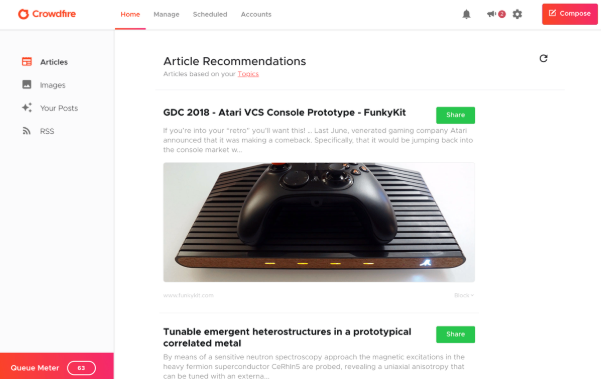 The tool allows you to discover relevant content based on your topics of interest, publishing content from your own blogs and sites, and even the option to pre-schedule your content. The analytics features are handy as they cover post-performance and follower details. Description: The PostPlanner app is fantastic for those who are looking to keep their social accounts up-to-date with fresh trending content. Like most other social media management tools, the scheduling feature comes equipped with the necessary functions. What’s really nice about this particular tool is the content discovery engine. By default, Post Planner has various topics, industries and status ideas for you to share to your social profiles. The popular content section is extremely useful for finding content that is likely to receive engagement. Post Planner have developed their own star rating algorithm that helps predict engagement. The more stars the content has, the more likely the engagement you will receive. Description: MavSocial is an effective social media management tool for curating, scheduling and managing your social presence across a wide range of networks. 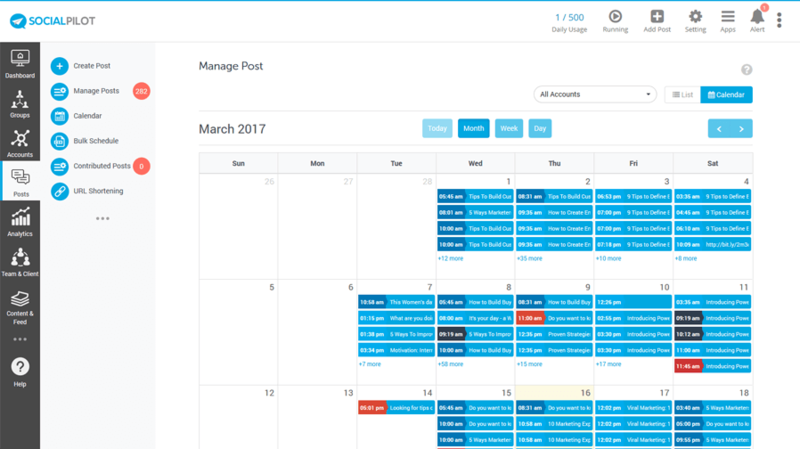 The tool features easy scheduling and automation options, a social inbox, social listening, and much more. The report feature that consists of actionable real-time data allows you to understand your social media performance and act on it to get even better results. MavSocial is accessible on the go with the handy mobile apps. Security is a big thing MavSocial care about, they’ve even set-up AI image recognition for managing digital assets and also 2 step verification for accessing the accounts. 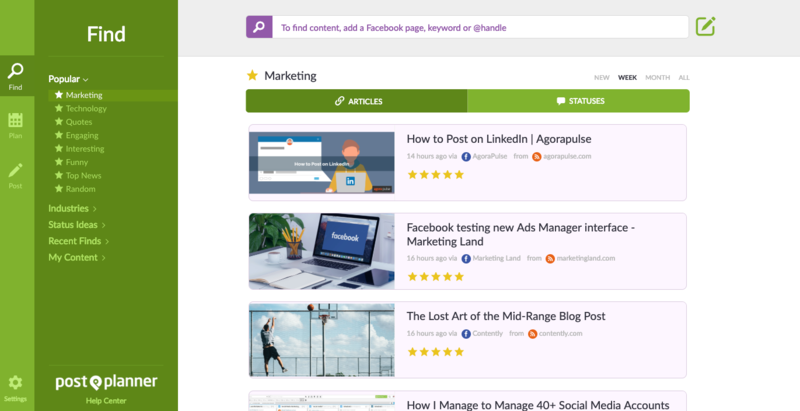 Other key features include the ability to curate content with their smart search capabilities, collaboration features and much more.